Last year, on December 5th, a young man was shot and killed by a police officer at the Hollywood & Highland intersection, right around the corner from my Los Angeles apartment. This happened in a flurry of news stories of other cases of US police using deadly force. 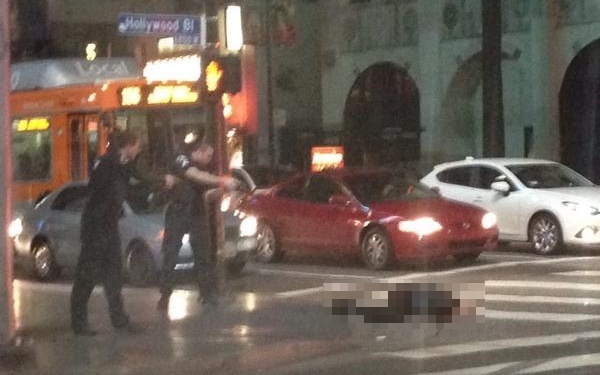 With the news came several disturbing photographs, including a photo of two police officers pointing their guns down at the man’s dying body sprawled out on the Walk of Fame. We co-create this reality that we experience together, and we can only create change together. The world does not need to be how it has been all along. We have the power to change everything, and we all have a role to play. Our purpose in life is highly individualized (to say the least) but no one is left out of this conversation. Don’t feel small. Don’t feel insignificant. Absolutely every individual alive today has the power to impact the future forever. Don’t waste time holding back or hesitating. The world is transforming, and not only do we have front row seats, we get to participate and co-create what the world will become after we transform.